This species of Dwarf or Pygmy Angel is one of the most popular , Growing to a maximum size of around 9 cm it will require a minimum size tank of around 50 gallon and plenty of rockwork to provide shelter although it will spend most of its time out grazing. It should be fed a mixed diet including Spirulina, mysis, brine shrimp and other prerared angelfish foods. The colours are arguably the most striking of any of the dwarf Angels , stunning red/orange body with black vertical stripes and the most striking purple and blue fins make thsi a hoobyists favourite the world over. 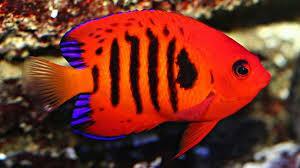 These Flame Angels are the truly striking variety from the Marshall Islands and have the strongest colouration of any other.